Last week, I wrote about the enticement of power, how power corrupts the flesh and how good Christian people in avoiding power like a plague miss the opportunity of seeing power as a gift to be stewarded rather than a poison to be shunned. This week, I continue with some thoughts about a second temptation: Money. I watched IP MAN 3 last night, a movie about a Chinese legendary hero, Ip Man. He was the said teacher of the famous Bruce Lee. A top martial arts pugilist, he pioneered a special kung fu called the Wing Chun martial art. 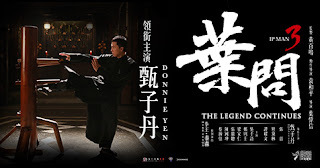 This third installment, while not as good as the first one that launched Donnie Yen to fame, has enough bells and whistles to make it a worthy watch. There are many wonderful values in the film. There is the value of friendship, where leaders from the top pugilist schools regularly show respect to one another in admiration of their respective skill-sets and legends. There is the value of integrity, where people meant what they say, did what they promise, and kept their word. There is the value of marital love, where the protagonist lays everything aside, his reputation and fame, just to care for his cancer-stricken wife. Yet, a movie plot is not very exciting without villains and some level of bad behaviour. Here is where my reflections on money begin: Money corrupts the soul of the person from the inside out. Let me share three examples from the movie Ip Man 3. The first was the forced sale of an elementary school that was sitting on prime land. With the title deed in hand, lots of money could be generated from the possession of the coveted piece of real estate. The shipyard chief (played by Mike Tyson) ordered his subordinates to do everything they can to force the school principal to sign over the school title deed. This included violence, intimidation, and even arson. The thugs were watching out for every opportunity to make it impossible for the school to operate. They beat up the school staff. They chained up the school compound. Shipyard workers operated not on the basis of integrity but blind obedience to their bosses. Jobs, obeying orders, and monetary concerns trumped ethics and integrity. Until of course, the famous Ip Man and his disciples came to the rescue, becoming overnight security guards to ensure that the school can still operate as usual. Though the school was not sold, the bad blood continued between Ip Man and the boss of the foreign owned shipyard, which ended in a dramatic 3-minute winners-take-all fight. The second is the collusion and corruption between the corrupt HK police chief and the Western Union shipyard boss, both of whom were played by non-Asians. Matters of security and law enforcement were usually the responsibility of the HK police. Unfortunately, money concerns took priority as the shipyard chief paid bribes to a caucasian police chief. With the money in his pocket and the promised future income, the police chief readily chose to ignore the crimes perpetrated by the shipyard personnel. It was a moment where greed for money became the primary motivation for wrongdoing to thrive. The movie director cleverly played on historical anti-colonial sentiments by showing how the foreigners were in cahoots with one another just to exploit the resources of the Chinese people. Money talked and led such foreigners on the path of extortion. The Chinese inspector in the police force knew exactly what was going on but was powerless to prevent his own boss's actions. The third example demonstrated that money is colour blind and can corrupt all kinds of people. Ethnicity is no guarantee that one would not become enticed by money. Knowing that there was another great Wing Chun exponent named Cheong, the thugs bribed the latter with money, making Cheong a mercenary in the name of wealth. Cheong was a complicated character. On the one hand, he appeared to be a man of principle and integrity, choosing even to offend his bosses in order to help maintain some law and order. Yet, he allowed greed to consume him and eventually crippled another pugilist master unrelated to him. Money moved the man to do things he wouldn't have normally done. Money corrupts. If we crave money, we would become enslaved to activities driven by the pursuit of monetary gains. The shipyard boss, the corrupt police, the greedy mercenary, were all driven by a common lust: Money. Whether it was property rights, bribery, or corrupt practices, the love of money led to one common result: Injustice, inhumane, and injury. One of the major acts of greed is how people adopt the using money to make money doctrine. The way the shipyard owner tried to force through the sale of the prime real estate showed desperation of wanting to spend some in order to gain more. Such measures of trickery and deceit exist today as well. The other day, my wife was telling me about a hairdresser who was encouraged to give up her rental space at a prime location in order to move to another less popular location. This hairdressing owner regretted the decision to this very day, accusing the previous landlord of deception just to take over her coveted space and customers. Her old location was quickly occupied by another hairdressing saloon. Not only did she had to start afresh at her new location, she also lost her own customers to the new hair saloon. All businesses run the risk of flouting ethical rules and basic human decencies. When money becomes the overriding concern, good and reputable business practices can easily go out the window. It takes a principled person to ensure the rules of fair play are intact. A friend of mine will be conducting a course on "What Does Christian Theology Have To Do With Banking?" on January 30th, 2016. There is a free first lecture (9.30am to 12pm, Jan 30th, 2016) that is open to public. Send an email to inquiry@bgst.edu.sg if you are interested in attending. Will our giving hurt the poor rather than help? Are handouts disempowering the poor? Are we giving out of goodwill or out of some guilt trip? Do we give toward what the poor really need, or are we giving out of our own personal conveniences? Poverty is a complex matter not easily solved by some handout or some monetary investment. It takes intentionality. It requires our personal investment of time and effort. Above all, it needs love. Without love, we can end up becoming enslaved to money and what money can do, to use it for self-interests rather than serving others. Toward the end of the Ip Man 3 movie, the hero of the show said something rather profound which I paraphrase as follows: "The best investments are made by spending time with the people we love." Instead of showing up at a challenge for the most authentic Wing Chun master challenge, Ip Man chose to spend time dancing with his dying wife. Instead of becoming distracted by reputation and fame, he chose to stay behind closed doors with his own family, supporting his wife as she goes to the hospital for cancer treatments. At the end of it all, family is more important than money. How we live, and how we invest our time, will show our true allegiances. Far too many people are spending their time making money under the guise of providing for their families. They work long hours. They do over time. They sacrifice their weekends just to appease their customers in order to maintain their mantra: "The customer is king" or "The customer is always right." These philosophies are reflections of our enslavement to money. Why is the customer king? It is because the customer has what we want. Why is the customer always right? It is because we want to remain on the right side of the customer's pleasure so that when the customer wants to part with his money, or his company's money, he would know who to give to. At the end of it all, we would have to ask: Is it worth it? As people grow older, sometimes they would look back at the "good old days" and lament at how quick, how able, and how witty they were in business or in all manner of worldly achievements. As muscles ache, bones creak, and pace of life slows, sometimes they would regret at not spending enough time with their families. One common sign is how older adults miss their children's growing up years. As fathers travel widely and mothers spend time in the office extensively, the children grow up spending more time with their domestic helpers or their teenage friends. Parents returning home from their overseas trips will become so exhausted that they sometimes say to their friends: "Quality time is more important." 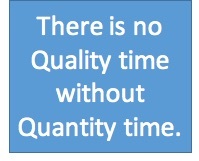 The fact is this: There is no quality time without quantity time. Learn not to let money dictate our lives, but to let the Word of God direct us on how we spend, how we give, and how we live. Money is important but money should be placed in its appropriate level of importance. Family is most important. Our children grow up much faster than we can sense. Our marriages need the fertilizer of time, the sunlight of love, and the nourishing waters of regular communications. Let not our relationships be dictated by our pursuit of money. Let our desire for love put all things in perspective.